In August Aruban writer and artist Rosabelle Illes (1987) joined the social active collective Groundation Grenada as a writer-in-residence to create new work and provide a creative writing workshop for young writers that focused on exploring, challenging and dismantling clichés about the Caribbean. In ‘Grenada: My Desired Stop’, available on Groundation Grenada’s website, she reflects on her residency. Here are some excerpts; the full reflection can be read at http://groundationgrenada.com/2014/10/10/grenada-my-desired-stop. […] During my residency at Groundation Grenada in the month of August 2014, I met extraordinary people and I engaged in inspiring events at the historic Priory on Church St. and Clark’s Court Cave at Ft. Matthew. These were all part of ‘Forgetting Is Not an Option’ Phase 1, a collaboration with Arc Magazine. A yoga class from Groundation Grenada director Malaika Brooks-Smith-Lowe challenged my self-imposed physical limitations. Visual artist Robin de Vogel’s workshop on reinventing mementos increased my awareness about the souvenir industry. My own creative writing workshop on dismantling the Caribbean cliché allowed me to experience ‘on the spot’ fearless writing by Grenada’s emerging and established authors. The Caribbean film night and the ‘Take Tellings Jam’ session reinforced my belief in the talent our region cultivates. And the hike to the sulphur spring brought me into a state of automatic moving mediation. It was evident, I was a visitor in Grenada but I was home. Not that Grenada closely resembles my native island of Aruba or my current home The Netherlands. To the contrary, Grenada is a lot different, inside and out. It was these differences that sparked a notion of home, but home in terms of origin, home in the sense of the source, if you will. I did most of my thinking while using the island’s public transportation system. In fact, I felt most at ease when I was packed in these mini-vans with about 15 passengers while loud reggae music distracted us from the heat. These buses describe so much of what I have come to experience as the island of Grenada. […] On one of my last days on the island I took a bus that was in very good shape compared to the others I had been traveling in. The seats had nice new covers free of holes and what surprised me most were the bells above each window. […] I told the driver where I would like to stop since it was dark and I could not recognize the area. He then let me know that I was on the wrong bus because he does not go as far as my destination. He told me I had to go back to town to get another bus. The other passengers told the driver to just take me the extra five-minute ride as it was already late. The driver did not appreciate the behavior his passengers were expecting from him. Although I of course wanted to reach my destination as soon as possible and despite my biased interests, I could also understand the reason the passengers expected this gesture from the driver. After spending some time with the locals last year when I visited Grenada, this trip reaffirmed the existence of some sort of powerful trusted karma on the island. I say trusted because I noticed that the Grenadians I encountered tend to give with confidence. It seems the full circle is so automatic, so imminent, so imbedded that spending time recollecting favors takes away from time best used to continue giving. Despite the passengers’ peer pressure, the driver pulled over to let me out so that I could take a bus back to town to subsequently take a bus back up. Once I stepped out of the van I began walking to my destination instead of trying to get a bus back to town. As the driver slowly began to move his vehicle, the other passengers kept telling him that he cannot let me walk in the dark and that he must do me a favor. After a few back-and-forths between the driver and the passengers, the driver told me to step back into the bus. Once I arrived my destination I paid the driver double the price of the ride but it did not seem like he considered the payment a display of the trusted karma in action. That night, after the experience in the new van with the perfectly covered comfortable cushioned seats and fancy bells, I kept thinking. Up to that point, my bus rides in run down vans with friendly people, nice music, seats where the filling was coming out and no bells, were one of the highlights of my days. Sure I questioned development as I looked inside the busses and wished for the island to have newer vehicles and yes I questioned development as I looked outside the bus and wished for the island to renovate buildings and possess newer technology and resources. Yet as soon as I experienced a developed bus-ride I wished to go back to the good old days when we knocked [on the sides of the bus] instead of ring bells. There’s this small phrase I kept hearing from many Grenadians, it still resounds gently from my left ear to my right: “it’s okay”. On my second day in Grenada, I entered a store in town to purchase a bottle of soap. I did not have enough coins to pay for it so I asked the gentleman where I can find an ATM machine. He told me where the closest ATM machine was but he said he wants to make a deal with me. For now, he’ll let me take the soap for the coins I had, “it’s okay” and next time when I come back to shop there I can give him the remaining coins. At this point I thought great, I do not look like a tourist because who would make such a deal with a visitor whose stay is temporary and is less likely to return to the same store? Yes, during my residency in Grenada I heard about the problems, the issues, the history, the revolution and the challenges the island faces. It is not my wish to ignore parts of Grenada while magnifying others. However, despite its difficulties, I feel Grenada is in a fortunate position. It is on the verge of increased development while it is populated by heart. What I am trying to convey is that the people have heart, the people are hearts. Yes, all islands and all countries have their troubles but to me, Grenada — as a state of mind — is where I wish to stop. It is my desired stop. It is where I would knock on the side of whatever I am being transported in and get off. It is from where I wish to cultivate wisdom to render myself capable of moving forward. So that when I develop, I can trust with ultimate confidence that it’s all okay. During my residency I realized that Grenada is an island I wish to visit more often and I would like to continue working with Grenadian artists. For this reason, I am ending this account with a call to current airline companies operating in the Caribbean region or those looking to engage in a new business endeavor and start a Caribbean airline company: It should be easier, quicker and cheaper to travel between the islands in the Caribbean region. A direct flight from Aruba to Grenada would take approximately 3.5 hours. It took me 9 hours to reach my neighboring island. Yes we have been colonized, yes our past lurks and yes we are limited as small entities, but we have all of that in common. So let’s grow closer as a region and continue to inspire each other while developing ourselves gently. Groundation Grenada you have been most kind, see you soon. 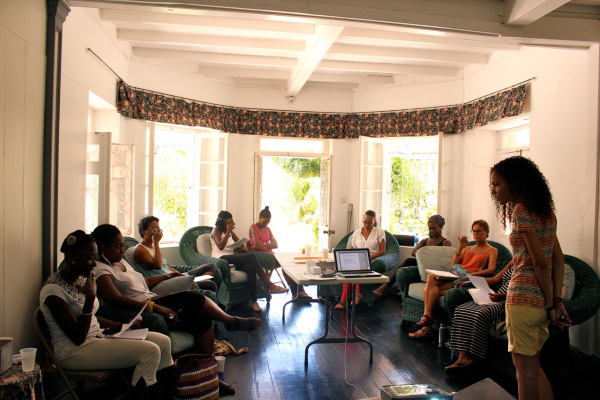 For more about Rosabelle Illes, check http://groundationgrenada.com/2014/08/05/dismantling-the-caribbean-cliche-creative-writing-workshop and visit her website http://www.rosabelleilles.com.